(IMU). The IMU collects data from each sensor circuit and sends a digital output to the control transmitter. The control transmitter provides air temperature and velocity information on a Liquid Crystal Display (LCD) screen and to a Building Automation System (BAS) through analog outputs (2 to 10 VDC or 4 to 20 mA). The factory-assembled AD-1252 Thermal Dispersion Probe Airflow Measuring System incorporates up to four thermal dispersion probes, a shielded CAT5e communications cable and an DMPR-RA002 Electronic Controller. AD-1252 System products are backed by a 3-year warranty, which covers defects in materials or workmanship. Read the Catalog Page. On December 12, 2012 we finished our Holiday Meal Drive with a donation of 20 Holiday Meal Baskets. Overall, we expect these baskets to feed between 90 and 120 people this Christmas. The baskets will be given to St. Vincent De Paul Emergency Food Center for distribution to local Cranston, RI families. Each basket includes: mashed potatoes, stuffing, olives, cranberry sauce, vegetables, pickles, fruit cocktail, and a gift card to purchase a turkey. We would like to sincerely thank all of our staff who contributed to making this year’s drive a success. The company wide annual safety meeting was held on August 6th at the Sprague Mansion in Cranston. All employees attended a training class on Asbestos Awareness presented by RI Analytical. Several safety topics were reviewed and discussed, including workshops to bring safety awareness to the forefront of the employees' minds. Representatives from Red Wing shoe were on hand with samples and we had 100% employee participation in the safety shoe program! This year's safety meeting included a food drive and we are proud to say our employees contributed 374 lbs of food to the RI Community Food Bank. 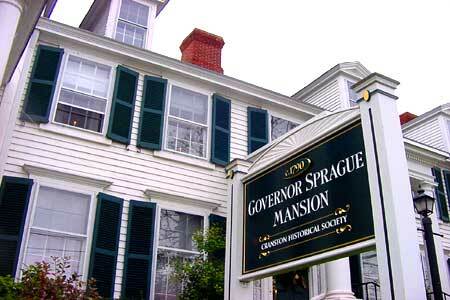 EMC Services has held several events at the Sprague Mansion. We are happy to support the Cranston Historical Society and their preservation efforts of our local history. The mansion (built in 1770 with an addition in 1864) and the Sprague family are a tribute to Rhode Island's textile history. Energy Management and Control Services, Inc. is proud to be the recipient of the Johnson Controls 2011 Contractor of the Year award. This prestigious award is given to the contractor that showed high sales and sales growth. We were selected from a group of 75 Authorized Building Control Services contractors throughout North America and Canada. And share this award for 2011 with only one other contractor. The award was presented at the 2012 ABCS conference at Mohegan Sun Casino in March. Thank you to all of our customers and employees for their support in making 2011 a successful year!